In addition to checking the images, you can also correct/register some business card information of cards that have not yet been digitized. Here we will show what actions you can take towards cards that are still being transcribed. Cards that have not yet been digitized, until the processing is complete, will be displayed temporary data read from an OCR. Cards that are not displayed as "Transcribing" may sometimes be handled as "Unreadable Cards". For cards still being transcribed, the following actions can be taken. 1. Click on "Transcribing". Click on the "[Transcribing] " link. 2. 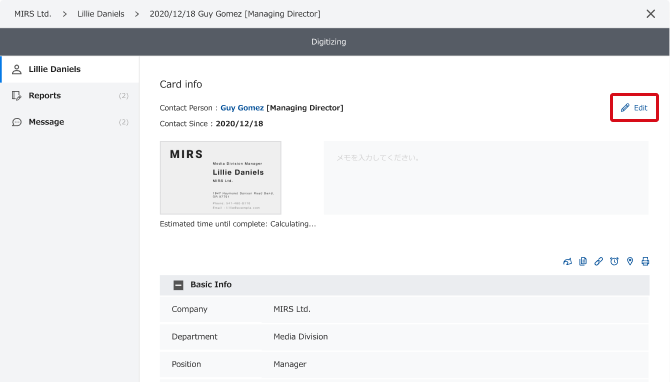 The Business card detail screen will come up. Please register or correct relevant items.